Until the spring of 2018, if you travel on the Shin-Osaka - Hakata Shinkansen route, you have the opportunity to take the unique 500 TYPE EVA Shinkansen train, operating on the Kodama service. 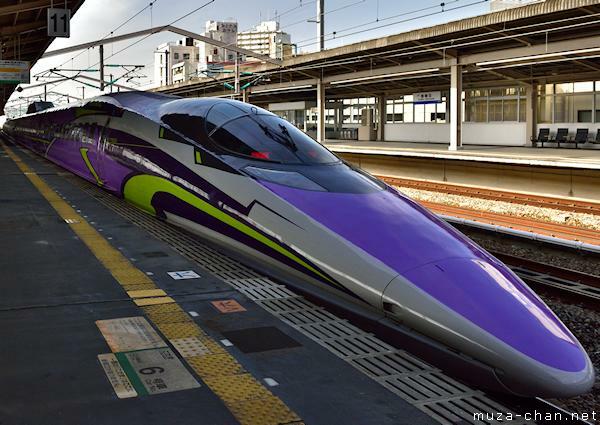 Inaugurated last year to simultaneously mark two anniversaries, the 40th anniversary of the Sanyo Shinkansen and the 20th anniversary of the Evangelion TV anime series, the 500 TYPE EVA trainset livery and the interior of the first and second cars were designed by the same team that worked on the Evangelion anime project. Travel tip: If you plan to take the train, be sure to visit the 500 TYPE EVA PROJECT official site, where besides more information you will also find the trainset’s schedule.